Fine quality cream with safe ingredients to temporarily relieve chest and nasal congestion and coughs. Temporary relief from minor aches and pains of muscles. 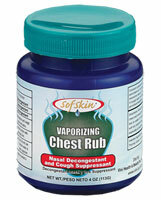 The vaporising feature acts quickly to reach lungs, clearing nose and windpipe of congestion. Available in two different sizes of packs for easy usage and choice viz. 4 oz (113 g) and 2 oz (56 g).